The UK’s artificial intelligence sector is growing faster than rivals in America, Canada and Australia – putting Britain on course to be the global leader in AI technology. That’s the finding of new data released by the world’s largest job site, Indeed. AI technologies require highly skilled workers who can develop and maintain complex systems and applications. In the last three years, demand from UK employers for these types of workers has almost tripled, according to Indeed’s data. Roles typically include data scientists and machine learning engineers, specialists who play a crucial part in teaching machines how to use and interpret data. Millions of us interact with AI on a daily basis, often without realising. Smart home devices like the Amazon Echo, or cutting edge tech such as facial recognition software and driverless cars, are some of the more obvious examples of AI in use. AI jobs also pay well above the UK average salary, with data scientists typically taking home £56,385 a year and machine learning engineers earning an average of £54,617 a year. Despite the financial rewards on offer, there is still a challenge to find the talent. Indeed researchers found that the share of available AI jobs in Britain outstripped the share of interested candidates by 6 times. The number of UK job seekers looking for AI roles has doubled since 2015, but it’s still struggling to keep up with demand from employers. Thanks to its booming tech sector, the UK has a higher concentration of available AI jobs than the United States, Canada and Australia. 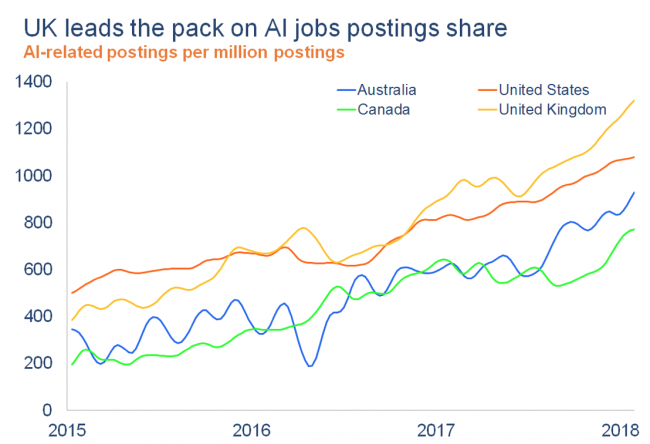 At the start of 2018, 1,300 out of every million UK jobs advertised on Indeed were in AI, nearly double the level in Canada and over 20% more than the level in the US. Tara Sinclair, economist and senior fellow at Indeed, said: “From both a jobs and a society perspective, AI is a technology that has the potential to be truly transformative. While the jury is still out on how many existing roles could be made redundant as AI becomes more widespread, or whether its potential for job creation outweighs any losses, in the short-term AI is providing a shot in the arm to Britain’s jobs market. 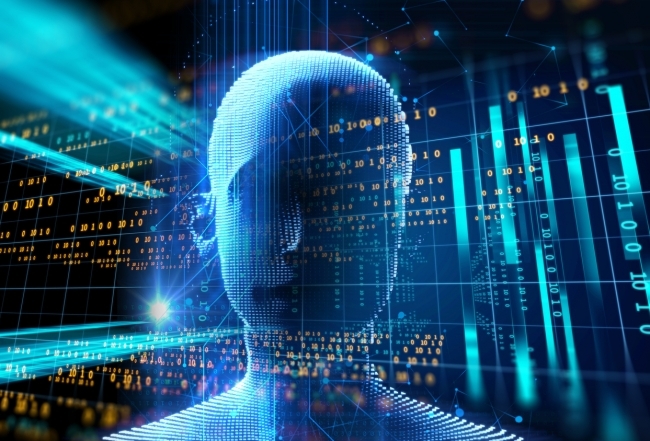 “A number of companies are exploring how AI might be used to boost their bottom line, while also holding out the prospect of previously undreamt of technology that could one day excite and delight millions of people. “Britain’s reputation as a tech leader has made it a natural home for the booming AI sector, and the UK’s concentration of AI jobs has risen steadily – and now outstrips that in the other major English-speaking countries.